Our hands perform a multitude of tasks everyday like writing, typing, driving, domestic work, etc. As a result, the wrist joint suffers from repetitive injury leading to excruciating pain, stiffness and swelling. Such an injury can lead to serious wrist deformity leading to the cessation of the wrist movement. 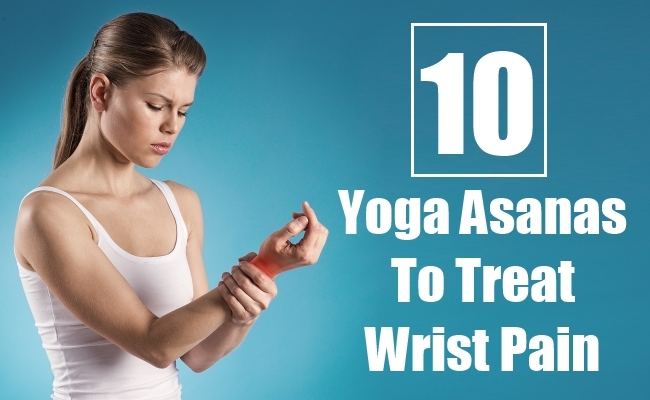 However, there are a handful of yoga exercises which can help strengthen your wrist joint and can effectively treat the pain in the area. Regularly performing these asanas can show dramatic improvements in the ailment. 0Begin by standing in Mountain pose with the feet close together and both the arms at the sides of the body. Keep the spine straight and pull the shoulder backwards. Now raise your arms above your head and join both the palms. Gradually straighten both the arms and hold onto this pose for about 10 breaths and then return slowly to Mountain pose. Begin this pose by standing in Mountain pose next to a wall. Now lift your left hand and with your elbow bent slightly, place the palm of the left hand against the wall. Your arm must be at the height of your shoulder Now turn your palm in such a way that your fingers point inwards. Now, slowly straighten the elbow and try to push the wall with your hand. Stay in this pose for about 2 minutes and then repeat the pose with your right hand. Begin by standing in the Mountain pose and stretch both your arms right in front of you. Now interlock the fingers with the little right finger at the free end. Now raise your hands over the head, keeping the fingers interlocked. Let the palms face the roof. Hold the pose for about 15 minutes and then slowly release the fingers. Repeat the pose by changing the interlock of the fingers. Begin by standing in the Mountain pose next to a wall. Gradually lift your heels upwards and now press your tailbone towards the wall. Try to arch your shoulder and the upper abdomen backwards so that only the lower abdomen is in contact with the wall. Hold in this pose as long as you can and then slowly relax. Begin this pose by sitting on your buttocks and keeping both your feet to the outside of the left hip. The left foot must be placed over the arch of the right foot. Now place your left hand over the outer edge of your right knee. Take your right arm backwards and hold your left arm with the right hand, rolling your right shoulder backwards. Open your chest and turn the head towards the right. Hold this pose for about one minute and then release your hands and legs and repeat the pose by changing sides. Begin this pose by sitting on your knees with your feet on the sides of the hips. Keep your spine straight. 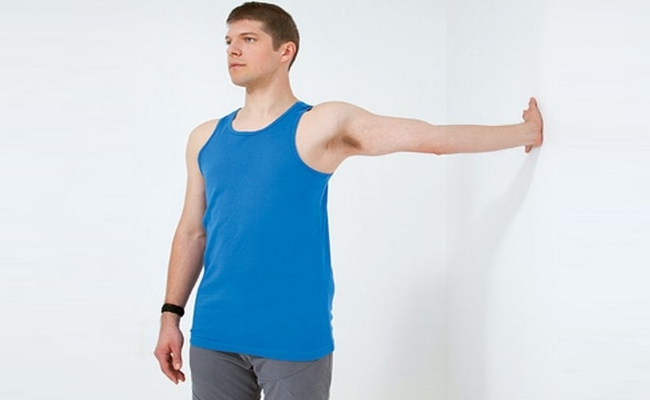 Now, take your right hand backwards and bend it from the elbow in such a way that the lower arm passes between the shoulder blades with the right palm facing inwards. Take your left hand and bend it from the elbow, allowing it to pass upwards, from the back. Now, try to hold the fingers of right hand with that of the left hand. Stay in this pose for 10 breaths and then repeat the pose by changing the side. Start by standing in Mountain pose. Keep a distance of about 12 inches in between both the feet. Now, slowly bring both the hands backwards and try to press the palms firmly, together with your fingers facing upwards like you pray. Stay in this pose for about 30 seconds and then come back to Mountain pose. Begin this pose by standing in Mountain pose keeping the feet hip distance apart. Now bend down from the hips and gently slide in both your hands under your feet. Exert pressure with your feet over the hands. Try to keep your knees and legs straight. Bend the elbows slightly from the sides. Hold this pose for about 30 seconds and then relax and come back to Mountain pose. Begin by standing in Mountain pose with your feet at a distance of about 12 inches. Now bring both your hands in front of you, parallel to the floor. Keep the palms facing each other and bend the arms from the elbow upwards at ninety degrees. Intertwine both the hands so that the thumb is towards your body. Keep this pose for about 10 breaths and then return to Mountain pose. Begin this pose by standing in Mountain pose with a distance of about 36 inches in between both the feet. Now bring your right leg forward keeping the right feet at an angle of 90 degrees and incline your left feet at an angle of 45 degrees. Now bring both your arms behind your back and press the palms together, as in prayer position and bend from the hips over the right leg. Hold this pose for 5 breaths and then repeat the pose by changing sides.